Learn to Lindy Hop with Rusty Frank & Peter Flahiff as they bring you the same easy-going, in-depth style that they used to successfully teach thousands of students around the world. This series will get you dancing in no time. 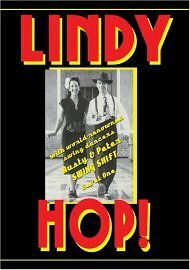 Most importantly, you will learn the skills you need to dance with Lindy Hoppers around the world. As Lindy Hopping continues to evolve as a dance, this video will teach you the technique and vocabulary for dancing all styles, including Hollywood Style, Savoy Style and LA Style. Disk 3 adds more follower tips, leading tips, and common swing moves. It also includes a couple of drills - “eyes closed” and “Jedi” - that are always good drills for everyone. This disk also presents discussion and demonstrations of the differences between the two “classic” Lindy Styles: “Hollywood Style” and “Savoy Style.” That’s a big deal…. Anyone who’s ever gotten tangled up in, or, confused about these two styles will appreciate the discussion - and those who’ve never heard of “the styles” in detail will be better off for having seen and heard Rusty and Peter lay out the differences plainly. To recap the series, Lindy, like “East Coast Swing,” Bal-Swing, Collegiate Shag, and other swing dances, is danced to Swing music using common swing moves on top of the different swing "basics." Rusty and Peter in this series present the Lindy “basic” and common swing moves in “Lindy form,” and give you enough to do that it should eventually feel natural to, “Lindy,” out on the dance floor. A “Disk 4” would have been nice for “Lindy-Charleston,” but if you study these disks carefully you can pick that up easily later on. Very good “beginner” disks that are upbeat, helpful, and actually get into, and out of, some typical “beginner Lindy” tight spots with a good degree of intelligence…. They could also be better with some discussion of how to pick out the beats you’re going to be dancing to, but I guess there is always Youtube and Wikipedia for that. Anyway, rent, watch and practice to them all… These disks, alone, won’t make you a great Swing or Lindy dancer, but they will get you started with a very good chance of ending up one.